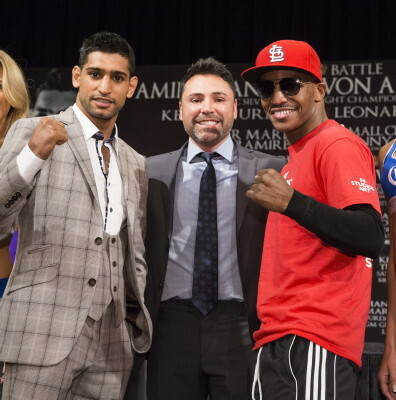 (Photo credit: Esther Lin/Showtime) Devon Alexander (26-2, 14 KOs) says he’s going to stand his ground this Saturday night in his important fight against 28-year-old Amir Khan (29-3, 19 KOs) on Showtime from the MGM Grand in Las Vegas, Nevada. Alexander wants to trade with Khan, and he’s not planning on using movement or tying him up in this fight. That doesn’t mean that Khan is going to accommodate Alexander by standing in the pocket and going toe-to-toe with him, because Khan seems to have learned his lesson about getting into wars with his opponents. Khan learned the hard way that it doesn’t pay off for him to battle his opponents. After back to back losses to Lamont Peterson and Danny Garcia, Khan has changed his fighting style to where he now uses a lot of clinching and movement in order to keep from getting hit. Thus far, it’s worked well for him because he’s won his last three fights, albeit against weak opposition. Khan’s new trainer Virgil Hunter wants Khan to fight smart and take less risks, and that’s exactly what he’s done in his last three fights. The negative thing is Khan isn’t as entertaining as he once was. All the holding he does has turned Khan into a somewhat safety-first type of fighter. It may wind up being a track meet for Alexander whether he likes it or not. You can count on Khan using a great deal of moving around the ring as he jumps in to throw a 2-3 punches before getting away. Alexander, if he’s going to land anything in this fight, he’s going to need to time Khan for him to be able to land. Khan isn’t going to stand and trade because the danger is too high that he’ll get knocked out. To be sure, Alexander isn’t known for being a big puncher, but he really doesn’t need to be in order to knock Khan out. All he needs to do is land the perfectly placed shot that stuns Khan. Once he has Khan hurt, he can then jump all over him and look to finish him off with a flurry of shots. I think that’s why we’re probably going to see Khan playing it safe with a lot of holding and moving in this fight.